Too many Christmas decorations to pack away? 28 Dec Too many Christmas decorations to pack away? This year make it easy on yourself after Christmas by cleaning and clearing out the decorations you did not use. First, hit the after Christmas sales and buy several stackable clear plastic boxes with good handles and lids, that are all the same. (Rubbermaid makes great tubs as suggested) Using large labels, a marker, brown Kraft paper and tissue paper label the boxes per category. THROW AWAY any old lights. They may not work next year. THROW AWAY the ornaments you don’t like. THROW AWAY the broken decorations. We all have them, your third-grade picture in a snowflake frame that doesn’t hang anymore – either fix or throw it. Also throw away anything made of Cheerios or real food. 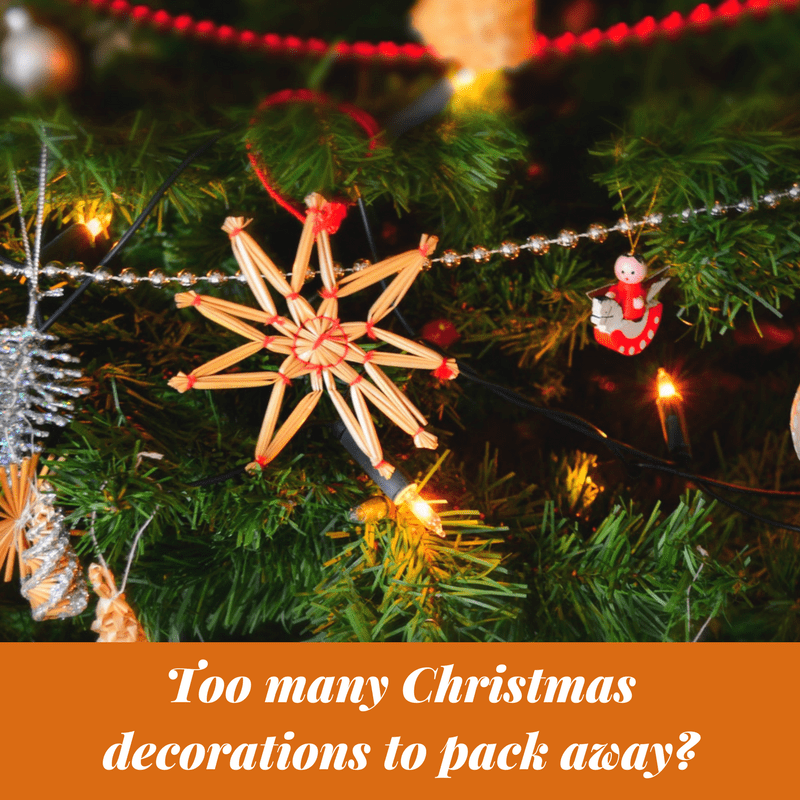 THROW AWAY the wire ornament hangers that are all tangled up. THROW AWAY the strands of pearls or balls that have lost their luster. THROW AWAY the old tree skirt that is stained and dirty looking. AND the “gently used” wrapping paper and gift bags. If you didn’t use the ones from last year with Mickey in a Santa suit, I promise you won’t next year either. That goes for Snoopy too. Remember to label which boxes come out first. For instance, the Advent wreath and the wreath on the door might make the first cut. If you have special cookie cutters, put them in that box too. You might have some leftover Christmas cards to put in that box. Make some notes to yourself, for instance, “loads of candy leftover, too much ham, used 10 red wines and 4 whites, get tablecloth pressed, not enough cocktail napkins, etc” Put the note on top of the box taped where you can’t miss it. Lights and garland. Store them by wrapping around your arm loosely and securing with large twist ties. The same way yarn and electrical cords are packaged. Breakable ornaments. Make a nest of brown paper by crumpling it up and laying on the bottom of the box. Next wrap each ornament in tissue paper. Then place them loosely on top of the brown paper and add more tissue paper crumpled up around in the spaces left. Add another layer of crumpled brown paper over the top layer. Egg cartons also work to store smaller ornaments or balls and will fit stacked up in the plastic bins. The main thing is to get rid of the decorations you are packing away year after year and stealing your highly valuable space. Next year your house will be beautiful and not as messy, and…clean up will be easier too.